While buying Smartphone one of the main points which we consider is camera. We always buy a phone which has the better Mega Pixel and picture quality. Today we are going to talk about the five different features of your camera which you can use with ease, which will make your photos more perfect and give you options of doing adventures as well. So lets start the list, before we go ahead, we do understand that many of you must be aware about the some of the tricks mentioned below or know more than this, do share those tricks with us in comment section below. If you "shoot" an infrared beam directly into your phone's camera, the otherwise invisible light renders as a purplish beam in the phone's display. There are not many practical applications here, except perhaps allowing you to confirm if your TV's remote control is indeed running low on batteries. It's a simple, but useful little trick that people may not know. Just stick your phone's lens right up to the telescope and you'll be able to capture the magnified image on the other side. So if you are looking to capture the photograph of very far distance, then this tip will make your life easy. It also works great in pair with binoculars. Some have taken to calling this camera hack a "PanoDriveBy." 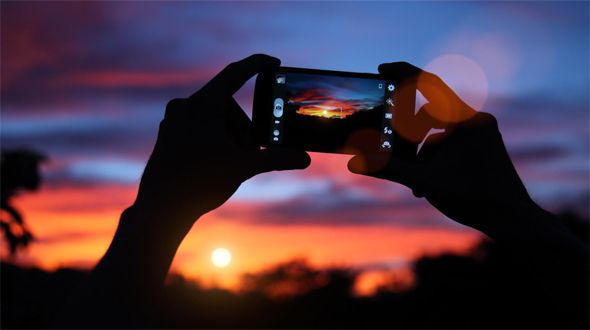 Most modern Smartphones come with some sort of stock "panorama" function that allows you to capture big wide vistas by stitching together various images as you tilt or move your camera (there are also plenty of third-party apps that do the same). While these are designed to be used by one person standing in one place, you can also make them work while in transit—just hold it steady and point it out the window. Your phone's camera isn't only able to see more than your eyes; it's able to know more than your brain—with the help of some apps and a data connection. Apps like Google Goggles or the Amazon-powered Flow can recognize objects, places, and even text (the former to get more data about you to sell to Google's advertisers, the latter to prompt you to buy things on Amazon). Google's Translate app can even recognize and translate written language—that means you can read every language in the world now! You don't need Instagram to make a Polaroid effect. You can do it with a piece of white cardboard. Just cut out a frame, but just remember to make one side of the frame thicker than the others to get that old school feel. Also, try making objects come out and through the frame for an added effect.